AMS offers custom made drill pipe, drill and adapter subs, deck bushing, breakout baskets and lifters to suit all drill configurations. AMS offers custom made drill pipe, drill and adapter subs, deck bushing, breakout baskets and lifters to suit all drill configurations. 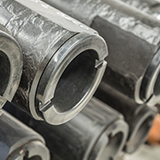 AMS supplies a complete line of quality drill pipe and associated products. Drill pipe is constructed using 4140 alloy mid sections along with hard-faced tool joints to minimize wear and extend pipe life and performance. AMS has the capability to supply drill pipe ranging in diameter from 3.5” (88.9mm) to 10.74” (273mm) to suit any configuration of drilling rig. In addition, all drill pipe is serial numbered for traceability. AMS maintains minimum stock levels of the most common drill rig configurations to eliminate lead times and better support the drilling industry. All industry standard threads including BECO, IF, API Reg, DIBH and CUBEX are manufactured using certified gauges, ensuring conformance to ISO 9001 quality standard. All drill pipes exceed API minimum standards for concentricity. 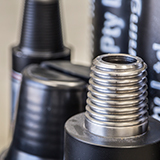 AMS’ extensive range of lengths, diameters, tool joint and thread configurations allows for individual customization of drill and adapter subs to suit all of our client’s requirements. Light weight deck bushes are made from a mild steel top plate, sleeve and bottom plate, which are welded together and then injected with polyurethane. We are able to achieve about 50%-70% weight reduction on these deck bushes, decreasing the possibility of manual handling injuries. 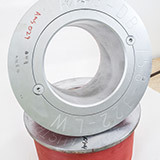 AMS offer both static, non-rotating deck bushing suited to DTH drilling and rotary deck bushing with a scope of double and triple race bearings. 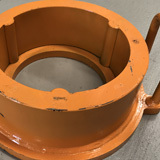 AMS designs and manufactures a complete line of breakout baskets to suit both rotary and DTH bits for a broad range of drill rigs. AMS deck bush lifters take the hard work out of bit changes. Our products are easy to use and light weight to ensure bit changes are carried out safely and efficiently. The handle has been load tested and certified as a lifting point. 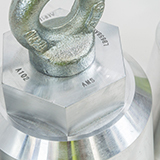 AMS has a range of heavy duty steel and light weight aluminium lifting bails to suit BECO and API thread types. All lifting bails contain a swivel to eliminate undoing of the thread on the lifting eye and are load tested and certified to American standards.